My weakness is outdoor gear. When I get home in the evenings I like to peruse YouTube in search of the latest camping or hiking or anything-outdoors gear reviews. So, it should come as no surprise that I have all sorts of gear crammed onto the shelves in my garage. And, because I am a trekking pole junkie, I keep no less than three sets of trekking poles in my pickup truck at all times. Better to be prepared! 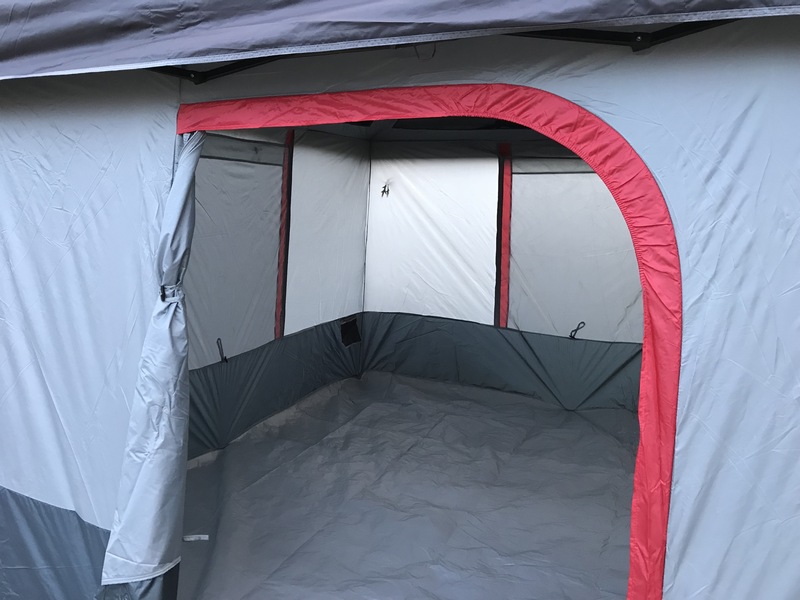 While recently watching a YouTube review of the latest in tents for car camping, I was wowed by a cube tent that attaches to the framework of a straight-leg 10 x 10 pop-up canopy. 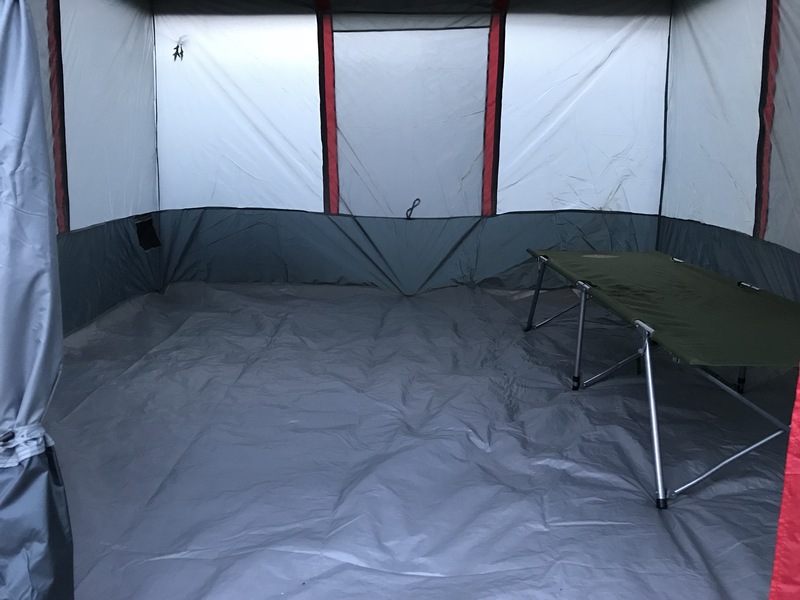 Amazingly simple and fast set-up that yields lots of usable square footage that, honestly, is closer to the glamping side of the camping equation. 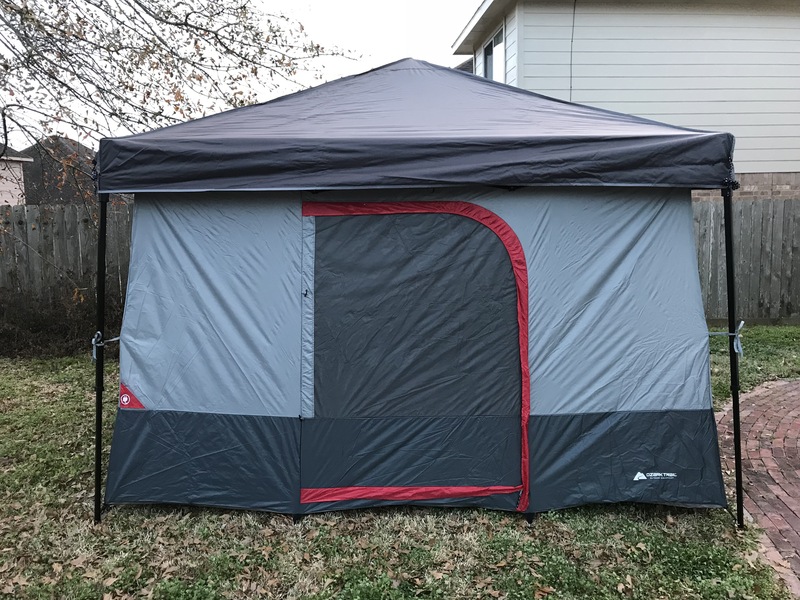 After doing some research, I found a very affordable version of this tent — the Ozark Trail ConnecTent. So, I placed my order on Amazon and then waited with all of the patience of a kid on Christmas Eve. When my packages finally arrived I couldn’t wait to get home to set everything up in my backyard. And then, it rained! At the first available opportunity, I unpacked everything in my backyard and proceeded to set up the tent. Although I managed to set my tent up by myself, the set-up of this particular tent would have been a bit easier with an extra hand to help. My wife Cheryl arrived home just in time to help me finish the job. Setting up this tent is really pretty intuitive. I began by setting up the pop-up canopy. 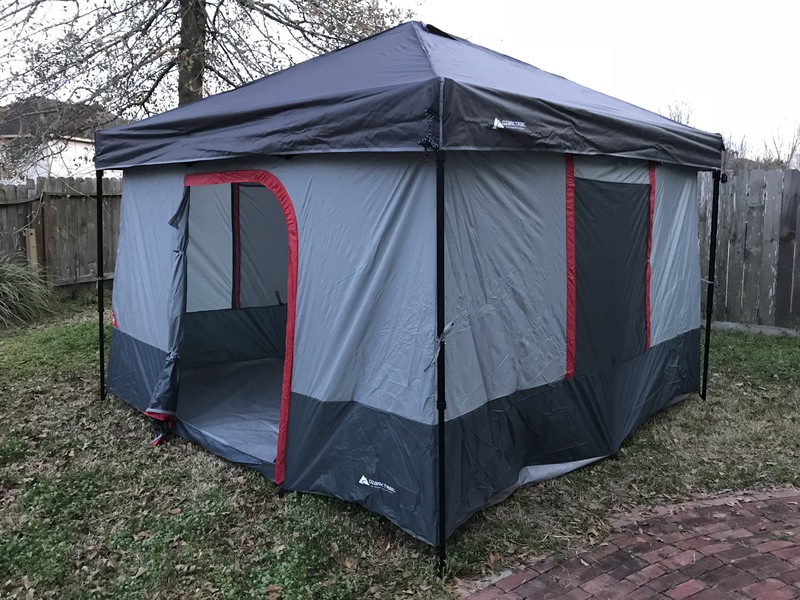 It is important to have a straight-leg rather than a slant-leg canopy in order to properly attach this particular tent. I raised the canopy to the lowest position and then proceeded to clip the tent to the framework. Very easy stuff. Once I had everything clipped into place, I staked down the tent. A particular feature that I like about the pop-up canopy is that it comes with four guy-lines already attached to the corners. This adds a good extra measure of stability, especially to withstand high winds. The inside of the tent is huge. I set up my camping cot just to get a feel for the interior space. Love the spaciousness of this tent. Perfect for car camping when I have the luxury of bringing extra stuff to set up a more comfortable base camp for hiking or biking in a state park. I will have my first opportunity to use my new ConnecTent under the big Texas sky when I attend the Llano Earth Art Festival during Spring Break. I have a camp site reserved and can’t wait to set up my tent for a fun weekend outdoors. Will write more after the festival in Llano. Until then, happy camping! 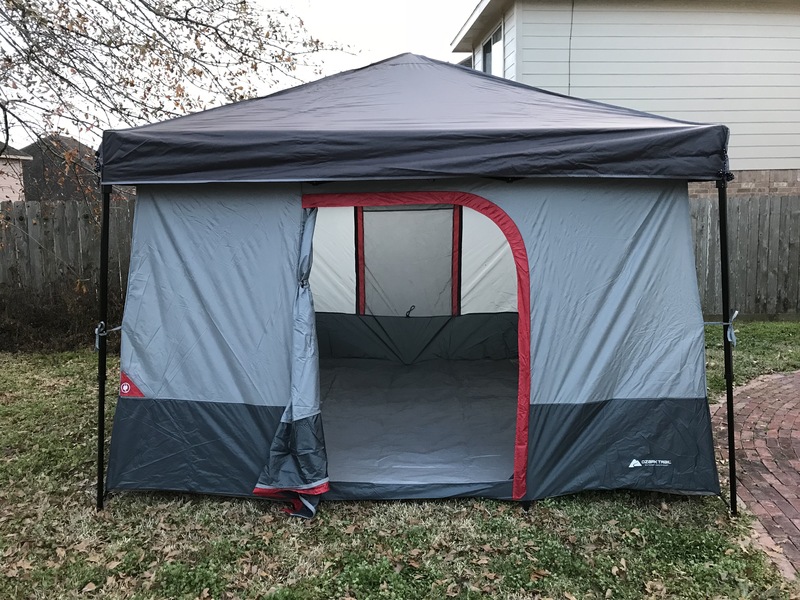 This entry was posted in Hiking and Camping, Outdoor Gear and tagged Camping, ConnecTent, Glamping, Ozark Trail Outdoor Equipment, Tents. Bookmark the permalink. Hi I’m wondering if the tent came with the canopy top cover ? Hi MB. No, I had to buy the straight leg canopy separately. Really like this tent. Worth the money for car camping expeditions.